The Southwest of France produces a host of interesting yet poorly known wines. Diversity is the key here. Look at the roll call of grape varieties: Tannat, Negrette, Auxerrois (or Côt, Malbec), Mauzac, Fer Servadou are just some of the obscure varieties that have been planted here since ancient times. This makes it perfect anorak territory. 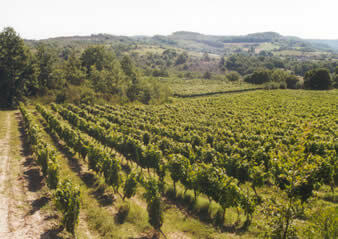 Perhaps the best known of the southwestern appellations is Cahors, which has a history dating back to the Roman times. The key grape here is variously known as Auxerrois, Côt or Malbec, and legally must represent 70% of the blend – the balance is made up with Merlot, or less commonly Tannat. Historically, Cahors had a reputation for producing dark, heavy wines (known as the 'black wine') that were often used to bolster up less substantial wines from Bordeaux. Phylloxera in the late 19th century, and then a devastating frost in 1956, decimated the Cahors vineyards, and despite the awarding of the appellation controllée (AC) in 1971, the region has taken quite some time to recover. Part of the problem is that Malbec has a tendency to make wines that are rather tough and charmless in their youth, and which require ageing. 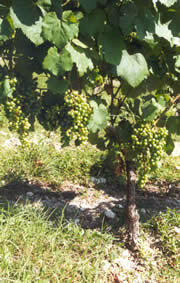 It's not a grape that has been terribly compliant with the modern thirst for fruity, accessible wines. However, in recent years, as in so many other French wine regions, things have begun to change and there are signs of progress. The first thing that struck me visiting the area was that for an AC region, there’s a surprising lack of vines. 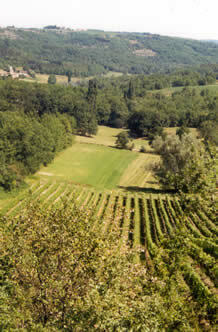 Normally, any AC region would have all the land within the boundaries planted with vines, but in the relatively green, pastoral Cahors region the parcels of vineyards are scattered around, and often interplanted with other crops. You get the impression that despite some external investment in vineyards here, the region still needs a bit of a boost. Part of the problem is that the wines are relatively cheap, which is good for the consumer but does act as a bit of a disincentive to vigneron ambition. Let’s hope that this changes. It’s certainly a pretty region, though, and there’s lots to hold the attention in the surrounding countryside. My visit was a fleeting one, but I intend to go back and do a fuller exploration, of both Cahors itself and also the other southwestern appellations.